The San Antonio Transit Company begins putting into service their new fleet of 50 air-conditioned city buses. 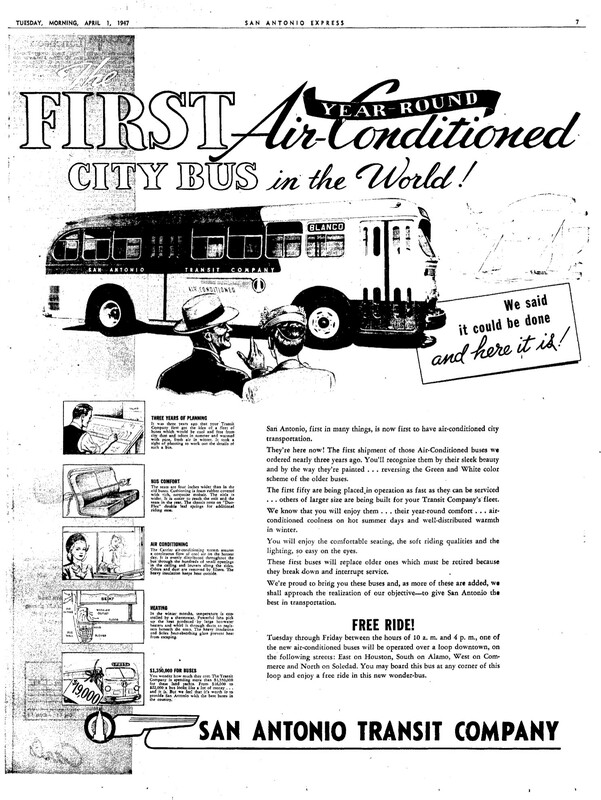 The Alamo city is the first city in the world to have air-conditioned metropolitan buses. They even offer free rides on a downtown loop between 10 a.m. and 4 p.m. The name of the producers of Pearl beer has been officially changed from San Antonio Brewing Association to Pearl Brewing Company, according to Datus E. Proper, vice-president and general manager. Longtime San Antonio grocers Centeno Supermarkets files for Chapter 11 bankruptcy.